(hat tip to the awesome folks at Spiderfan.org for helping me to read a version of this issue. Meanwhile, it’s been more than two weeks Marvel subscriber services … come on now). 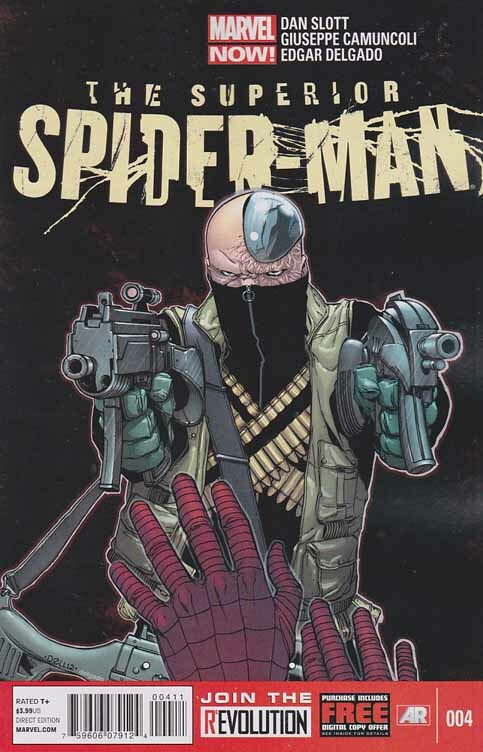 Superior Spider-Man is a comic book title sporting a seemingly higher body count than its predecessor, Amazing Spider-Man. And while the sudden death of a certain long-term Spidey supporting character in Superior Spider-Man #4 has created a negative stir from a wide and varied spectrum of fans because of its nonchalance, the carnage is helping to forge a very interesting and critical question that stands to drive the Superior title for the remainder of its existence: is the dark and twisted fate befalling nearly everyone connected to Peter Parker a result of his physical absence (and Doc Ock’s existence as the new Spider-Man) or are we all witnessing the consequences of Peter’s passive moral code when he was still physically capable of embodying Spider-Man? In other words, it’s easy to say that a character who’s been around as long as Ashley Kafka deserved better in the treatment and magnitude of her death(despite the fact that she hasn’t appeared in a Spider-Man comic in years). But I think that attitude from many fans is precisely why Dan Slott and Co. decided to end her Marvel run so cheaply. Just maybe we have all been so deluded and enamored with Peter’s “with great power comes great responsibility,” and “nobody dies,” mantras that we’ve lost sight of the potential destruction cause by a superhero with such a pure moral code. Now before I break the web site by causing people to believe I’m now advocating AGAINST how Peter Parker conducts his business as Spider-Man, let’s pause a moment and think of some things pragmatically. In some of the darker corners of the Internet, I’ve heard some fans criticize Spidey’s new status quo as some kind of sadistic hatred of Peter Parker and Spider-Man. In other words, because a bunch of editors/writers working for Marvel think Peter has long been a lame character in desperate need of reinvention, the entire premise of Superior is built around proving how a darker, more sadistic Spider-Man will do better than his predecessor. Obviously, I think that’s ridiculous. While I get frustrated by the sheer number of hoops Marvels makes long-term Spider-Man fans jump through from time-to-time, I also understand that the only thing that’s constant for a 50-year-old serialized character is change, and to think some of these dramatic shifts over the past decade or so are being put forward by Marvel’s editorial for any other reason than to just move as many comic books as possible is as paranoid as it gets. If Marvel truly “hated” Peter Parker, they wouldn’t be giving us a series where his astral self was fighting for control of his physical body with his arch nemesis. But after 50 years, I do think it’s totally fair for Slott, Marvel and anyone else, to raise questions about whether or not Peter has stayed true to the greatest lesson he ever learned in life. We all know that with great power comes responsibility, but when the face of evil is as cold and unfeeling as Massacre, or as calculating and intelligent as Doctor Octopus, how does one responsibly deal with such menaces? The cold reality is Peter is currently in an impossible situation because he underestimated the determination of one of his oldest foes in Otto. And now a good friend in Dr. Kafka has been ruthlessly killed because he was still unable to cross “that” line with Massacre during their previous confrontation. Peter certainly had the physical power to change the outcome, but he didn’t use it. Does that mean he abdicated his responsibility? Decades of Spider-Man fandom instinctively tell me that Peter did all he could, but innocent lives are still in real imminent danger because of his failings. 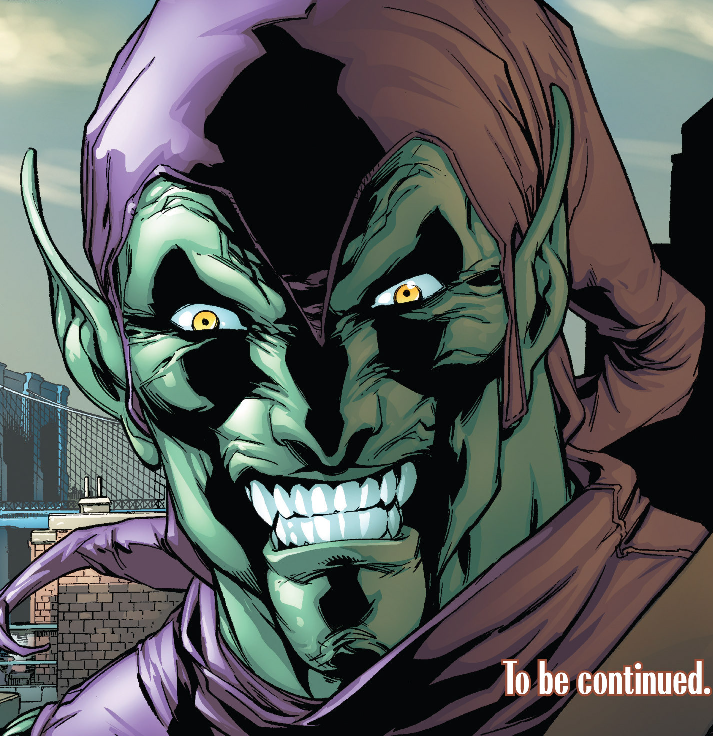 And now, interestingly enough, readers are left with a cliffhanger at the end of Superior Spider-Man #4 that sets up a future confrontation with the one character Peter nearly crossed the line with in the Green Goblin. Once Slott officially pulls the trigger on this match (and please, no spoilers for Superior #5 – I don’t usually get my issues until 2-3 weeks after they’re released on the newsstand), the Spidey Ock vs. Norman Osborn dynamic stands to be the most interesting one that the title can highlight. 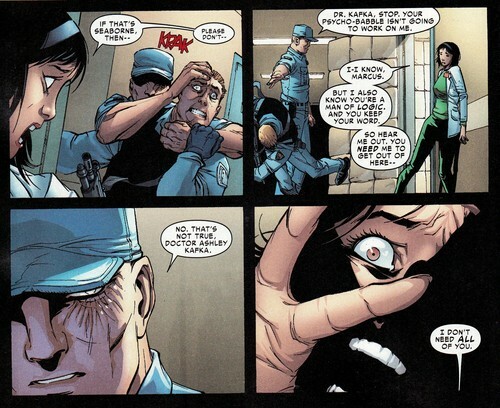 No one has caused more personal damage in Peter Parker’s life than Osborn, and yet with Otto Octavius in control of his mind and body, it’s going to be totally fascinating to see who’s moral code ultimately prevails – Peter’s ongoing fear of absolute power corrupting absolutely, or Otto’s desire to do whatever it takes to vanquish evil.